Last night, Warner Bros. held the New York City premiere for Batman v Superman: Dawn of Justice, with the studio hosting a live stream of the red carpet festivities. Official critic reviews for the movie are still under a strict embargo, but while we wait for those to roll in, Comic Book Movie assembled a number of early Twitter reactions from fans who were lucky enough to attend the premiere last night. The reactions are all exceedingly positive, despite a rash of rumors that the studio was worried about the movie. Last month, an unconfirmed report surfaced claiming Warner Bros.' was "worried" about Batman v Superman: Dawn of Justice, after the studio started screening the movie for select individuals. The report also claimed the studio may even push production on Justice League Part 1, and remove Zack Snyder as the director. Just a few days later, Warner Bros. put those rumors to rest, officially announcing that Justice League Part 1 will start shooting on April 11, with Zack Snyder at the helm. From director Zack Snyder comes Batman v Superman: Dawn of Justice, starring Oscar winner Ben Affleck (Argo) as Batman/Bruce Wayne and Henry Cavill as Superman/Clark Kent in the characters' first big-screen pairing. The film also stars Oscar nominees Amy Adams (American Hustle) as Lois Lane, Jesse Eisenberg (The Social Network) as Lex Luthor, Diane Lane (Unfaithful) as Martha Kent, and Laurence Fishburne (What's Love Got to Do with It) as Perry White; Oscar winners Jeremy Irons (Reversal of Fortune) as Alfred, and Holly Hunter (The Piano) as Senator Finch; and Gal Gadot as Wonder Woman/Diana Prince. Zack Snyder directed from a screenplay written by Chris Terrio and David S. Goyer, based on characters from DC Comics, including Batman, created by Bob Kane with Bill Finger, and Superman, created by Jerry Siegel and Joe Shuster. The film is produced by Charles Roven and Deborah Snyder, with Wesley Coller, Geoff Johns and David S. Goyer serving as executive producers. 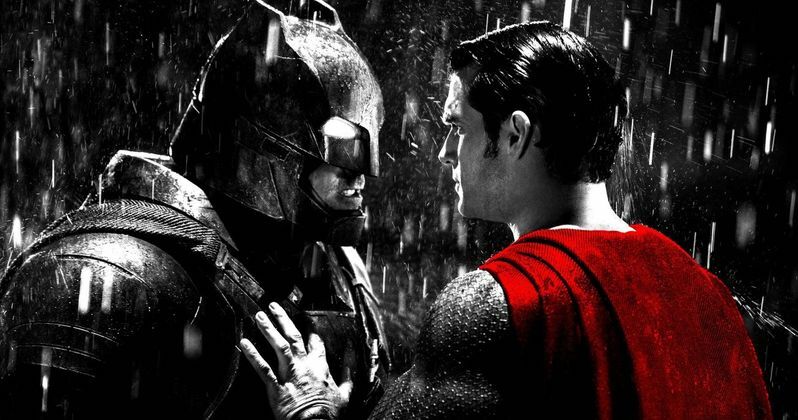 Batman v Superman: Dawn of Justice launches Warner Bros. new DC Comics slate of movies over the next several years. Next up will be Suicide Squad (August 5, 2016), followed by Wonder Woman (June 23, 2017), Justice League Part 1 (November 17, 2017), The Flash (March 23, 2018), Aquaman (July 27, 2018), Shazam! (April 5, 2019), Justice League Part 2 (June 14, 2019), Cyborg (April 3, 2020) and Green Lantern Corps. (June 19, 2020). We'll be sure to keep you posted as soon as the official reviews are posted, which will most likely happen either later today or tomorrow. Until then, check out the early Twitter reactions from Batman v Superman: Dawn of Justice, before it opens in theaters March 25.